I sometimes remember to hit the record button on the iPhone from time to time while I’m in the studio. Some of these are simple slideshows, giving you an idea of the step-by-step process as it happened. Others are footage of the various printmaking steps during the creation of a print. Enjoy! Sierra Art Trails is an amazing 3-Day Open Studio Tour of over 100 artists home studios, galleries and other unique venues , of all imaginable mediums, throughout Eastern Madera and Mariposa counties. Here are the promo videos from 2016 and 2017. Happy Birthday, National Park Service! I’ve celebrated by finishing my 12-prints in 12-months Yosemite Series of linocut relief prints. Many Happy Returns, Yosemite! Presenting, “Raising Swallows”, a 10-color, 9-impression, fine art linocut relief print, squeezed in over 3 months while I worked on other projects. A very special print to me for the cause it supports with its creation. 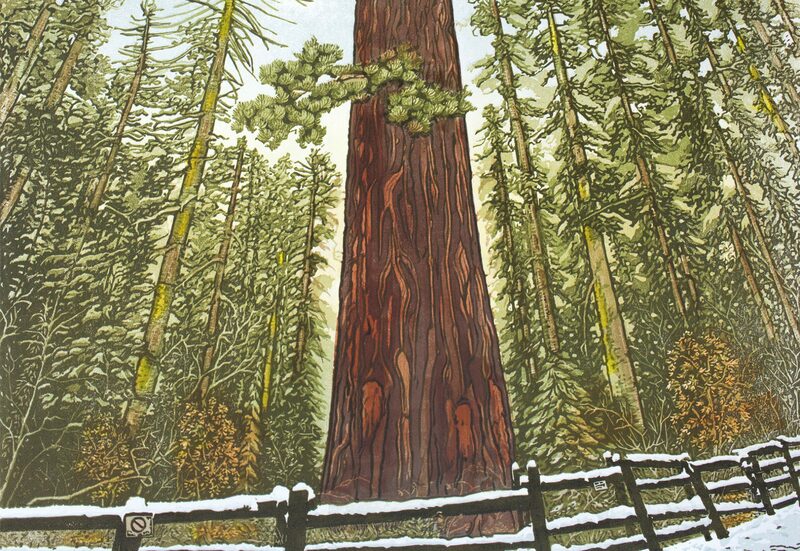 This video was made to invite people to attend the Sierra Art Trails 3-day open studio event, but also shows the steps involved in making the first Yosemite Series Fine Art Linocut, Taft Point Fissures – Yosemite. If you’ve ever wondered what the heck Printmaking is… Here’s the video for you! A pretty much start-to-finish video of a reduction-method, fine art linocut relief print! (Say THAT five times fast!). Enjoy! The video below is a simple video of how the carving progression in another 9-color reduction-method linocut, Bushtit’s Nest, went. Each slide is a carving between colors and later, each new color is representative of the carvings you see first.